On March 19, 1945, a Japanese dive bomber appeared out of the clouds and dropped two 250-kg bombs on the aircraft carrier Franklin (CV-13). Both bombs pierced the flight deck and exploded below on the hanger deck with many planes on both decks fueled and armed. The explosions and subsequent fires and flooding killed 724 men and wounded another 265. The light cruiser Santa Fe (CL-60) pulled alongside the listing and burning carrier through daring and skilled ship handling by Captain Harold Fitz. Santa Fe helped fight Franklin's raging fires and took on 832 men from the aircraft carrier. Franklin's Captain Leslie Gehres, determined to keep the carrier from sinking, kept men on board fighting fires and managed to bring the heavily damaged ship back to New York. The light cruiser Santa Fe earned the nickname of "Lucky Lady" due to her lack of casualties and damage despite participating in many WWII battles. 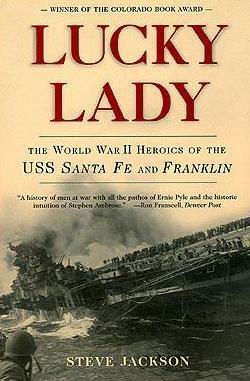 This book entitled Lucky Lady covers not only the wartime history of Santa Fe but also the carrier Franklin, despite the two ships having little in common other than being together on March 19, 1945. Chief Warrant Officer Donald Jackson, father of author Steve Jackson, entered the Navy in 1937 and served aboard the battleship Mississippi (BB-41) before being transferred to Santa Fe in December 1943 to be in charge of maintenance of radar and radio equipment. An entire chapter early in the book covers Don Jackson and his future bride Charlotte. Among numerous personal histories of Santa Fe and Franklin crewmen introduced in Lucky Lady, Don Jackson's story serves as the connecting thread from beginning to end. Franklin got hit by two bombs from a conventional dive bomber on March 19, 1945, but this aircraft carrier nicknamed "Big Ben" also was struck two previous times in suicide attacks. On October 13, 1944, four two-engine torpedo bombers made a run at the ship with one plane releasing its torpedo, which Franklin barely avoided through the captain's maneuvers to avoid it. Then the plane continued on to hit the flight deck. 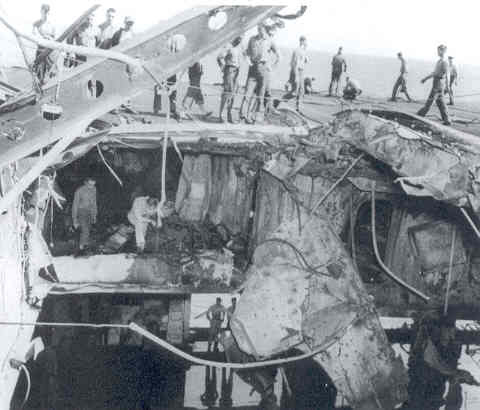 However, the bomber coming in at a slight angle bounced on the deck and went over the ship's side with the carrier suffering only one man dead and slight damage. Although many considered this to be a suicide attack, the Japanese Navy would not officially organize the Kamikaze Special Attack Corps until one week later during the night of October 19-20. On October 30, 1944, Franklin was east of Samar in the Philippine Sea, and three kamikaze planes headed toward the aircraft carrier. The ship's guns stopped the first one as it crashed into the sea next to Franklin. The second kamikaze crashed through the wooden flight deck into the hangar deck, where its 250-kg bomb exploded among planes parked there. Franklin suffered 56 deaths due to this kamikaze attack. The third suicide plane released its bomb, which barely missed Franklin, and then went on to crash into the light carrier Belleau Wood (CVL-24). Jackson inexplicably provides the following description (p. 260): "damage to the smaller light carrier was mostly confined to a half dozen planes, and the fire was quickly put out." Actually, 92 men died, 54 were wounded, and 12 planes were lost before the fires could be brought under control. Overall, the book provides quite a bit of background information about Japan's Kamikaze Corps and their attacks even though Franklin got hit by bombs from a conventional dive bomber, rather than a kamikaze aircraft, on March 19, 1945. Much of this information contains errors. Part 1 of Luck Lady covers the wartime history of Santa Fe up to January 1944 in the Marianas, and Part 2 gives the story of Franklin from December 1943 to August 1944 in Saipan. Part 3 includes both ships' histories in the Philippines from October to December 1944 with the chapters alternating between the two ships. Part 4 has a similar presentation of alternating chapters related to the events of March 19, 1945. The narrative often becomes difficult to follow with shifts between different persons and ships and with numerous extended flashbacks to provide the background of the person, ship, or event being discussed. The book lacks any maps to follow the movement of the ships. The center has eight pages of photos including three pages showing events of March 19, 1944. Numerous personal stories of Santa Fe and Franklin crewmen have been included in this history. Jackson interviewed many individuals to put together this book, and some factual errors and contradictions might be attributed to veterans' memories. The veterans usually do not speak directly for themselves in the book, but rather the author describes events and paraphrases their conversations and accounts. One of the most memorable chapters describes the Franklin crewmen's emotional reactions to Captain Gehres' formation of the 704 Club for those men who remained on the burning ship. He wanted to charge officers who left the ship with desertion, even though many had been forced into the water due to fires or explosions. Also, communications had broken down throughout the huge carrier, and many men thought the order to abandon ship had been given since it appeared that the ship was about to capsize due to heavy listing. The 704 Club engendered great dissatisfaction among the crew, especially since one officer testified that the number who actually remained the entire time with the ship was only about 400, and some names of those who had left the ship were added later to reach the total of 704. On the positive side, the book includes details of Lt. Donald Gary's rescue of almost 300 men trapped in Franklin's mess hall. He received the Medal of Honor for discovering an escape route from the mess hall and then returning three times despite fires and flooded areas to lead the trapped men to safety. Inaccuracies abound in Lucky Lady. Just a few examples illustrate the seriousness of these mistakes in a book claiming to be a history. The famous photograph of smoke rising from the aircraft carrier Bunker Hill (CV-17) after being hit by two kamikaze aircraft on May 11, 1945 , is incorrectly captioned as "kamikaze attack on the Franklin October 30, 1944." The author erroneously reports that two kamikaze planes hit the carrier Saratoga (CV-3) and killed 345 men on January 21, 1945 (pp. 349-50), even though the ship was in Hawaii at the time . Actually, the carrier Ticonderoga (CV-14) got hit and suffered 143 men killed and 202 wounded, which was a total of 345 casualties . The four-engine Emily flying boat  gets described in error as a dive bomber (p. 226), and the Oscar fighter  wrongly gets referred to as a dive bomber (p. 216). Jackson describes the Betty torpedo bomber that made a suicide attack on Franklin on October 13, 1944, with its wing guns firing (p. 168) and its belly gun shooting (p. 189) during the attack even though the Betty does not have such armament . Some statements contradict each other, such as when on page 188 this suicide plane that hit Franklin "continued off the port side" but on the next page "skittered off the starboard side." The book states that Vice Admiral Ohnishi flew from Manila to Mabalacat to form the first Kamikaze Special Attack Units (p. 222), but eyewitness accounts in a book listed in Lucky Lady's bibliography clearly indicate that Ohnishi rode a limousine there . On October 13, 1944, a twin-engine bomber hit the carrier Franklin in an apparent suicide attack. Jackson erroneously concludes that Rear Admiral Masafumi Arima piloted this Betty torpedo bomber that killed one Franklin crewman. In actuality, almost all sources, both Japanese and American, give the date of Arima's attack as October 15, 1944 . Arima, not a pilot, rode and did not pilot the Betty bomber . Despite the book's assertion that Mabalacat Airfield was under the command of Arima (p. 222) and that he took off from Mabalacat Airfield (p. 161), the 26th Air Flotilla commanded by Arima was based in Manila , and Arima took off from Nichols Field in Manila on October 15, 1944 . The heroic story of Franklin and Santa Fe deserves attention. Lucky Lady introduces the personal stories of many crewmen who became heroes that day when Franklin got hit by two bombs. However, the book lacks a high level of historical accuracy, especially related to Japan's kamikaze attacks. 1. Sources that correctly identify Bunker Hill in the photo include Kennedy 2008, 361; Steichen 1980, 83. 7. Inoguchi 1958, 4, 15. 8. Japanese sources that state Arima took off on October 15, 1944, include Inoguchi 1958, 36-7; Kitakage 2007, 258; Osuo 2005, 6-7; Ugaki 1991, 476; Yasunobu 1972, 44. English language sources include O'Neill 1999, 123-4; Warner 1982, 84. 11. Inoguchi 1958, 36; Warner 1982, 84; Yasunobu 1972, 44. Fry, John. 1996. USS Saratoga CV-3. Atglen, PA: Schiffer Publishing. Kitakage, Yūkō, ed. 2007. Tokkō no hon (Book about special attacks). Tōkyō: Kōjinsha. Steichen, Edward, ed. 1980. U.S. Navy War Photographs: Pearl Harbor to Tokyo Bay. Text by Tom Maloney. New York: Crown Publishers.